Remember the Princess Leia bikini costume from "Return of the Jedi"? Of course you do. And now it can be yours. Profiles in History is auctioning the fabled "Slave Leia" costume worn by Carrie Fisher in the 1983 blockbuster through the online site Invaluable.com. The skimpy prop goes for sale on October 1 with a starting bid of $80,000. As "Star Wars" devotees know all too well, the corpulent alien gangster Jabba the Hutt captured Leia when she infiltrated his headquarters on the desert planet Tatooine and he forced her to wear the bikini costume. The costume is made of "flexible, gold-painted red dense-urethane rubber," according to Profiles in History. It's an original that was worn on set, though some pieces were altered or replaced during filming "since several elements had to be resized due to Carrie Fisher's weight loss during shooting." 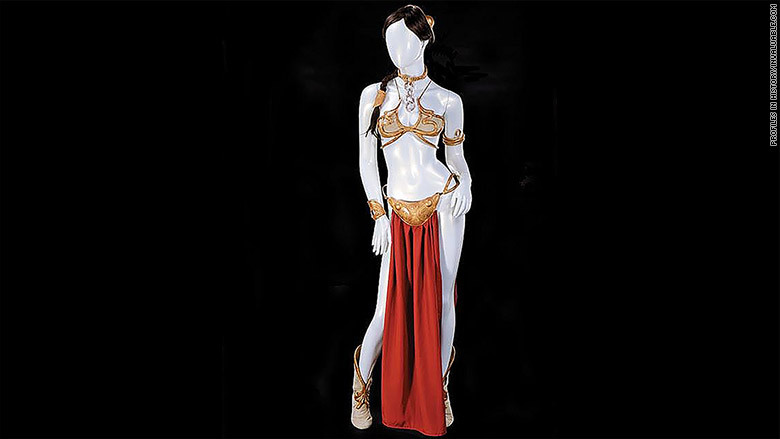 The skimpy "Slave Leia" costume from the 1983 blockbuster can now be yours. The costume includes a collar with several links of the chain that Jabba used to keep Leia on a tight leash -- and which she eventually used to throttle him. The bikini comes with a letter of authenticity from Richard Miller, the designer who worked for George Lucas' Industrial Light and Magic. 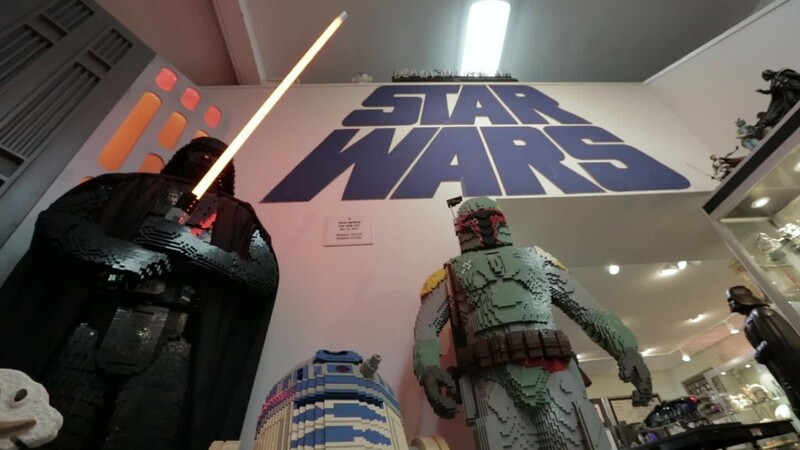 The auction includes an assortment of other "Star Wars" film props, including a Stormtrooper helmet with a starting bid of $10,000, a prototype of Darth Vader's helmet starting at $30,000, a model of a Death Star section with Turbolaser towers for $25,000, and a miniature of Leia's Blockade Runner for $200,000. The "Star Wars" franchise was taken over by Disney, (DIS) which bought Lucasfilm for $4 billion in 2012. The seventh movie in the series, "The Force Awakens," is in theaters December 18. Like the original movie, it takes place on Tatooine and stars Fisher as Leia.